The NF1 basketball season for women playing basketball in France is now in the last third of the season after the completion of round 20. Limoges maintain their advance at the top of the table while Armentiéres, Illkirch-Graffenstaden and Roche Vendée remain two games down in joint second place. Toulouse notched up their forth consecutive victory to hold on to sixth place. At the bottom end of the table, only US Laveyron came away with a victory. Coral Duval (left) scored 26 points and took 14 rebounds as Limoges bounced back from their defeat last weekend to beat Dunkerque (89-65). Limoges did not have everything their way in this game. They scored the first 6 points of the match and slowly increased their advantage (17-8) early in the first period. Bertrand Parvaud, the head coach of Limoges was required to make some technical changes and Limoges finished the first period with a 13-4 run to tie the game (21-21) by the end of the first period. Limoges went on to take control of the game during the second period by controlling the boards to lead (41-32) at the interval. Dunkerque were not able to contain the inside game of Limoges during the third period and fell further behind by the end of the quarter (46-65). The final period was just a formality for Limoges and Pevaud decided to give his youth players from the Limoges Basketball Academy some playtime as they went on win (89-65). Before the season started Toulouse were the favourites to dominate NF1 basketball this season because of the quality of their roster. Things have not worked out as planned for them with so many injuries to key players. In general their opponents tended to lift their own game when playing Toulouse. However things have changed recently and Toulouse have won their fourth straight game after beating Charleville-Mézières (67-56) at home. Alain Jardel the new head coach of the French U20 team was also in attendance for this match as it gave him a chance to watch Carole Lebouc from Toulouse and also Amel Bouderra and Alex Kusion from Charleville. The match itself started with both sides more or less cancelling each other out during the first eight minutes (12-12). Toulouse, struggling to break the zone of their guests, switched to distance shooting with Nadia Péruch (28 points - right)and Emmanauelle Hermouet connecting three times in three attempts from the land of many as Toulouse won the first period (21-13). Charleville went inside with Floriane Herrscher (14 points) and former Belgium international Dana Boonen (19 points) at the start of the second quarter. Their side managed to reduced the deficit slightly. However Toulouse weathered the storm and with clutch distance shooting went into the interval leading (36-29). Once again Charleville - more active at the start of the next period - scored 5 quick points which included a trey by Kusion (34-36). Valérie Garnier, the head coach of Toulouse, called for a time-out immediately to break the rhythm of the guests. She also switched all the players towards Péruch, who in turn rewarded her with 11 points during the rest of the quarter. Toulouse led by as much as 15 points at one stage and went into the final period with an advantage of 11 points (51-40). Justine Agbatan has not found her scoring touch. 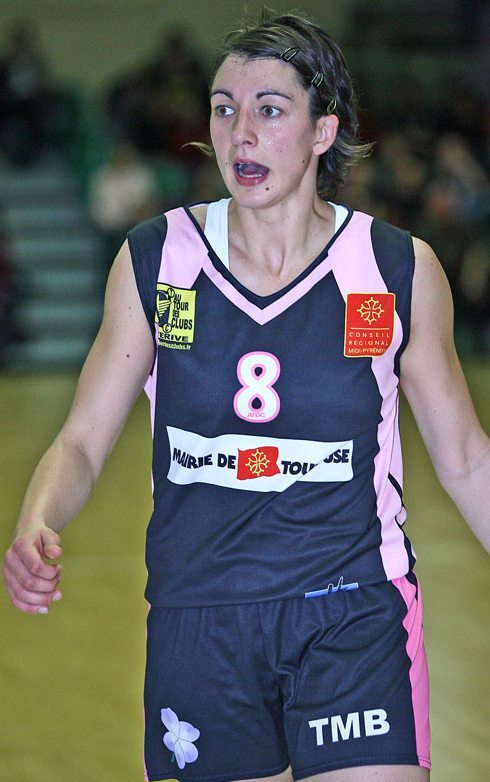 But she used her experience in exploiting space and making openings which allowed Hermouet (29 points - left) all the time she required to score as Toulouse paced themselves during the final period to win (67-56). Toulouse are now one game behind Charleville but have a better head to head if the teams finish tied at the end of the regular season. This result brings Toulouse back into the play-off picture. Roche Vendée are not in the same form they were when they dominated the first part of the season. 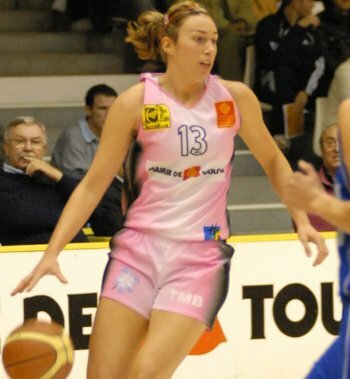 They required in the end the calmness of Jennifer Galand to hold off Colomiers (67-64). Roche Vendéé started the match well and led by 8 points early on. Then they lost their concentration which allowed their guests to get back into the game. Roche Vendéé led (17-13) at the end of the first period and were unable to make any progress during a poor error-prone second period but maintained their advantage at the interval (29-25). Colomiers played the better basketball in the third period. With Flore Perotto conducting the play they went into the final quarter with a 7-point lead (48-41). The hosts trailed by 9 points with less than three minutes to play. Yet they pulled themselves together to draw level (63-63) with 50 seconds to play. This defeat leaves Colomier stuck in last place and three games away from safety. For Roche Vendée they stay in joint second place with two games down on the leaders. 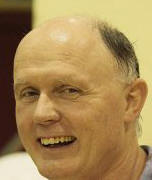 For Jean-Claude Geyer, the assistant coach of Illkirch-Graffenstaden, the SIG road victory against Voiron (67-62) was a big relief. This is the fifth consecutive victory for the SIG. At the same time Geyer will be happy with Aline Fischbach who led the team in scoring with 16 points. She also dished out 3 assists. She had an injury that kept her out of the side during the start of the season. She is now finally back to her best. Nice also won for the third straight game with a road victory against Ifs (78-64). Strasbourg ABC's negative series is over with a home victory (92-74) against Pleyber-Christ. US Laveyron pulled themselves together in the fourth period to beat the CFBB (74-57). Rennes were crushed at home to high flyers Armentières (46-87).